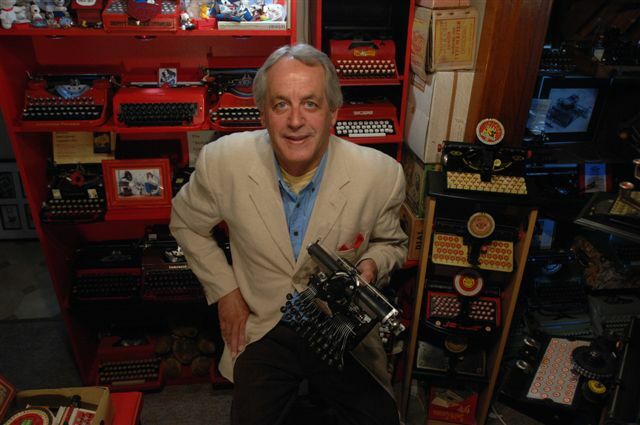 oz.Typewriter: The Invisible Typist: What Will They Think of Next? 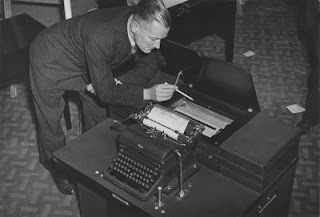 The Invisible Typist: What Will They Think of Next? a small mechanical roll perforator controlled by a typewriter keyboard. The fanciest Auto-typist console was equipped with an automatic selector mechanism enabling the operator to choose the desired paragraph or complete letter by turning a dial. The roll mechanism was based on the Western Electric Piano Company's ‘Selectra’ used in their coin-operated pianos in the mid-1920s, originally patented by Russell I.Wilcox, who later developed jukebox record selector mechanisms. 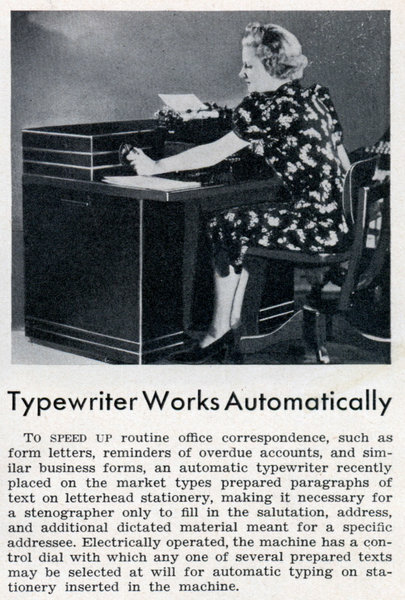 It is also explained that in the 1940s, “the Auto-typist system was great for boilerplate. Using a perforator, text was prepunched into player piano-like rolls. When needed, the documents were typed on a typewriter that read the rolls. As the roll passed over slots in a bar, a valve opened and negative pressure in a hose collapsed a small bellows that pulled down the typewriter key." “Boilerplate is a phrase or body of text used verbatim in different documents such as a signature at the end of a letter. Boilerplate is widely used in the legal profession as many paragraphs are used over and over in agreements with little modification or no modification. Boilerplate is stored by the word processor on disc and copied into the document as needed. The function that inserts boilerplate in Microsoft Word is called 'AutoText' and Word can be the default editor for writing Outlook e-mail. In the Eudora e-mail program, boilerplate is called 'stationery'." I have a unit circa 1964. Up to 30 selections. Did you know that a similar unit controlled Abe Lincoln at Disneyland? Otto Schulz was my great uncle. I'm familiar with the Schulz pianos, we had one. While I knew about the Auto-typists, I had never looked into it until now. Thanks.